Mexican sterling silver and wood cup by William Spratling. 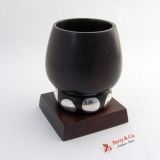 This handsome cup is 3 3/4" tall, 2 1/4" in diameter, the base is 2 3/4" square. The excellent original condition and clear, crisp detail, with no monograms, removals, repairs or alterations, make this an especially attractive offering. The soft, warm, original finish is present, with no buffing or machine polishing. 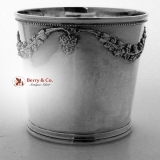 Antique coin silver beakers or julep cups by Talbott, Bailey & Co., Indianapolis, Indiana, c.1850. The above partnership of Talbott & Bailey lasted for a short time in the early 1850s. 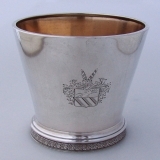 All silver made by Bailey or as a partner of Talbott is quite scarce and desirable. 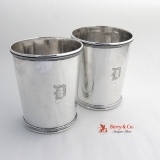 These handsome cups are 3" in diameter, 3 1/2" tall and weigh a total of 252 grams or 8.1 ozs Troy, each cup is monogrammed D. Very good original condition with no removals, repairs or alterations, make this an especially attractive offering. The soft, warm, original finish is present, with no buffing or machine polishing.